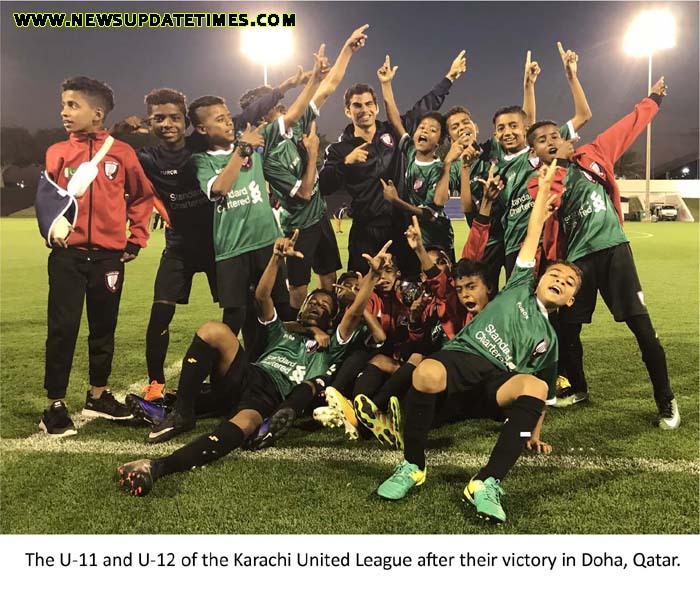 Lahore (Muhammad Yasir) Karachi United’s Youth Academy U-11s and U-12s created history by beating Aspire (Qatar’s National Football Academy) in bilateral four matches’ series in Doha, Qatar. Coming on the back of a previous successful visit in 2017 which included famous Tunisian club, Etoile de Sportive and the recently concluded KU Standard Chartered Youth League which helps nurture talent from within Karachi’s communities, the team performance was recognized as outstanding. Qatar were recently crowned AFC Asian Cup winners after an excellent campaign that saw them beating the likes of S.Korea, S. Arabia, UAE in the semis and Japan in the final. Qatar, who are also the hosts of the next World Cup in 2022 have set up world class facilities with top coaches at Aspire with a structured football excellence program. Most of the members of the Qatari football team that won the Asian Cup are graduates of Aspire, which makes KU’s achievement all the more praiseworthy. The U-12s led by coach, Hamdan Sheikh won all 4 of their matches, winning 4-2, 4-0, 4-0 and winning the last match 5-3 on penalties after a 0-0 draw. The U-11s had a roller coaster ride under Academy Head Coach, Kareem Kerai as while they won the first match 4-1, lost the next two 3-4 and then on penalties after a 0-0 draw. In the final do or die fixture, the KU boys showed great resilience to win 3-0 and take the trophy on aggregate. After a tournament win in China in 2017, the KU Academy has once again shown its potential and hard work in achieving this success. 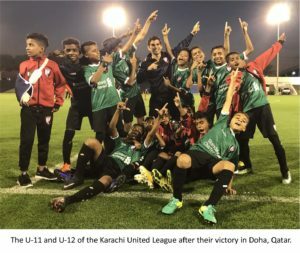 The Pakistan U-15 national team that beat India and made it to the final of the SAFF U-15 also comprised 5 current and 2 former KU Academy players. Imran Ali, the CEO and Director Youth & Alliances stated that the trip had been a huge success on and off the field. While singling out the brilliant technical performances on the pitch, Imran had special praise for partners Standard Chartered for creating the necessary environment for youth players to develop and reach such standards “without SCB’s support, these players would not have received the necessary competition to hone their skills. Not only does the Youth League keep them engaged in sport and healthy activities in otherwise very difficult circumstances but gives them the competition required to play under pressure and develop themselves”. Ali Ata, KU Director Development added that through the vibrant Pakistan community in Qatar, KU had great support both at the matches and for the future. Ata especially acknowledged the role of the Honourable Ambassador of Pakistan to Qatar, Mr. Syed Ahsan Raza Shah who not only hosted the KU Board at the Embassy but also attended the third round of matches, which provided a real boost to the players. 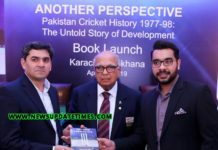 Director Football Development, Taha Alizai was of the view that this tour had once again affirmed KU’s belief in the level of talent available in Pakistan. 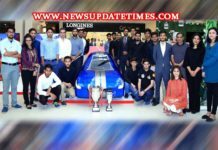 Taha thanked Aspire and especially its coaches and staff, the Pakistan Ambassador and hailed the support of the Pakistan community specifically, Aarij Wasti and Mustafa Peracha. Taha also stated that in meetings with the Qatar Football Association and Qatar Supreme Committee, KU had very positive feedback for future collaborations with Qatar, on the back of a very successful Pakistan Qatar investment conference (attended by Qatar’s Minister of Commerce and Mr. Abdul Razzak Dawood, Advisor to the Prime Minister), which had also followed high level meetings between Pakistan’s Premier, Imran Khan and the Emir of Qatar. 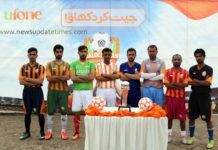 All the KU players and officials stated that they were all keen to see the day when a Pakistan player would play for a top international club and Pakistan would qualify for a top World football event such as the Asian Cup, Olympics or the World Cup.